In the first two parts of this trail, we made a very basic service and we enhanced it to accept a parameter. Both of these returned their responses as plain text. Plain text is ugly, so we want to be able to return HTML. Rich clients don’t like HTML so much, so we also want to return JSON sometimes. It’s time to see how Pedestal handles content types and response bodies. We will also get our first taste of interceptors. Use functions to create interceptors. Transform responses into other content types. Like Hello World, this guide is for beginners who are new to Pedestal and may be new to Clojure. It doesn’t assume any prior experience with a Clojure-based web framework. You should be familiar with the basics of HTTP: URLs, response codes, and content types. If you’ve already done some of those other things, you might want to skip ahead to Your First API to start building some logic and multiple routes. If you like to jump straight in to the deep end, you might be interested in the Pedestal Crash Course which assumes you know quite a bit about Clojure and web frameworks. This guide also assumes that you are in a Unix-like development environment, with Java installed. We’ve tested it on Mac OS X and Linux (any flavor) with great results. We haven’t yet tried it on the Windows Subsystem for Linux, but would love to hear from you if you’ve succeeded with it there. We’ll take this in small steps. If you get stuck at any point in this guide, please submit an issue about this guide or hop over to the mailing list and raise your hand there. In this guide, we will build on the same hello.clj that we’ve built up over the last two examples. We will enhance it to return a JSON content body. Then we will add the ability to look at the client’s preferred content type and make a decision about what to return. If you worked through Hello World, With Parameters, then you already have all the files you need. If not, take a moment to grab the sources from the whole shebang in that guide. Feel free to browse the complete sources in the repository, but be warned that the file contains all the versions that we built up through the previous guide. You’ll need to navigate some magic comments to pare it down to just the final version. Our first effort to deal with content types will be pretty manual. This is to show you what goes on under the hood before we use the handy built-in features that Pedestal offers. Don’t worry, this won’t hurt too much. It’ll also let us introduce the most important concept in Pedestal: Interceptors. You probably noticed that routes is created with a def not a defn. def creates a var and binds a value to that var. Under the jargon, that means it creates a new name in the namespace and attaches a value. defn is a macro that essentially expands into def with a fn, hence the name. That is a very precise way to say we forgot to define echo before using it. Let’s do that now. We’re going to define echo differently than our handler function hello. Instead of a simple handler function, we’re going to define an Interceptor. Interceptors are how Pedestal handles requests. Routing is done by interceptors. Parsing query parameters is done by interceptors. Even our hello handler function got wrapped up into an interceptor when we put it in the route table. 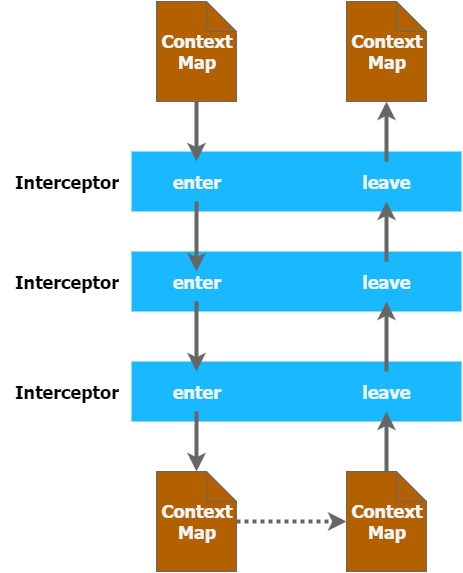 An interceptor is a data structure with functions in it. Each function receives a context map and returns a context map, as shown in this diagram. 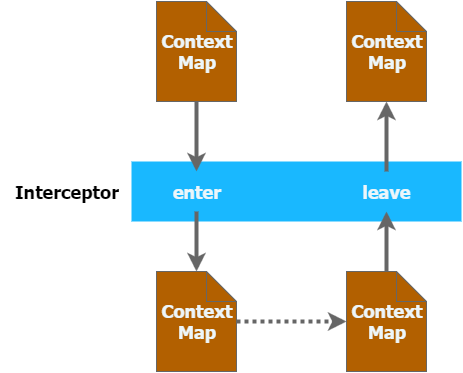 That context map contains the request map, the response map, and a queue of interceptors that still need to be invoked. An interceptors enter function is called on the way "down" the queue. Each enter function will be called in order. As interceptors are entered, they get pushed on to a stack to be called in reverse on the way back "up". Once the interceptor queue is empty, the leave functions are called from the stack. That means the leave functions are called in reverse order, as shown below. One important note here: As soon as any interceptor attaches a response to the context map, Pedestal considers the request handled. Remaining interceptors won’t be called, and only the ones that are already on the stack will have their :leave functions called. This is a "short-circuit" behavior like an early-exit in code. My advice is to build your value in the context with :enter functions, turn it into a response at the tail end of the interceptor queue, and then refine the response map with defaults, headers, cookies, and so on in :leave functions. Every interceptor can also have an error function, but we don’t need to deal with those just yet. 1 Interceptor names help with debugging. 2 We’re making an enter function. 3 Take the request map out of the context map. 4 Make a response map out of it. 5 Attach the response to the context map, and return the new context map. We normally wouldn’t write this in such an expanded form, but I wanted to show all the pieces one by one. Ultimately, we’re just making a map with the keys :name and :enter. When Pedestal sees this map in a route, it turns the map into an Interceptor record for you. This should look pretty familiar from Hello World, With Parameters. When Pedestal starts your service, it sets up some default interceptors for you. That includes an interceptor that does the routing. A router is just a specialized interceptor that looks at parts of the request, decides which interceptors to invoke next, and pushes those onto the queue. That means any other interceptor can also modify the queue! This is one of the big benefits of using interceptors: the ability to make dynamic decisions during request handling. That even includes the ability to bypass interceptors on the way back up. 1 Attach a header declaring the content type. As expected. But, something about that doesn’t seem quite right. We’re completely ignoring HTTP content negotiation. The client might want JSON instead of HTML. Or it might want plain text. Or EDN. The trouble is that the HTTP content negotiation spec is a royal pain. Fortunately, Pedestal provides an interceptor to help. io.pedestal.http.content-negotiation/negotiate-content does the job. If you look at the docs, though, you’ll see that is not an interceptor, but rather a function that returns an interceptor. This is a common pattern when you need to include some state or customize the behavior of an interceptor. You pass arguments to a function which returns an interceptor that "closes over" those arguments. It returns a data structure that contains functions that carry those arguments around with them. Let’s remove the content type header from ok and use this interceptor. 1 We’ll need this namespace soon to emit JSON responses. 2 This is the content negotiation namespace for Pedestal. 3 A short, picky list of content types we can emit. 4 Notice this route now has a vector of interceptors to invoke. Any time you change the dependencies, you will definitely need to restart your service. If you try this out, you’ll notice that absolutely nothing changed. That’s because the content negotiation interceptor handles the protocol, but it’s up to you to do something about the result. The interceptor runs the algorithm, then attaches the result to the request. That result is then available throughout the rest of processing. This is a great way to decompose your interceptors into small pieces that can be plugged together. It’s up to our service code to return a different body format depending on the accepted content type. It probably won’t surprise you that this is a job for another interceptor! Here’s our first stab at it. 1 Get the result of the content negotiation interceptor. Use "text/plain" as a fallback in case no suitable match was found. 2 Get the current response out of the context map, get the current body out of the response. This must have been created by a previous interceptor’s enter or leave function. 3 Translate the body according to the chosen content type. 4 Create a new response by attaching headers and the coerced body. 5 Return a new context by attaching the updated response. 6 Tell Pedestal to put this interceptor at the head of the queue. Why does this new interceptor go at the start of the vector? Take look at the picture of the interceptors above. The first one in the vector is called first for the enter function but last for the leave function. We want this interceptor to get the last word on the response body so it goes at the top. Turn the queue sideways to write it as a vector, and the topmost interceptor is on the left. It only takes a little bit to get used to this. Notice the content type returned by our service was "text/plain." Let’s try some others. Keep an eye on the "Content-Type" header in each response. So our coerce-body interceptor works as intended. As usual, I’ve written it in a fairly "non-compact" style so it is easier to see how the parts work with Pedestal. I see a couple of things we can improve though. First, there’s a straight-up bug. If a previous interceptor has already defined a content type, we should respect that and not overwrite the body or the headers. Second, we’re attaching a new headers map with only the "Content-Type" header. Any other headers attached by other interceptors will be lost. Finally, we could improve the testability by factoring out some of the logic into pure functions. We’re also going to touch up the echo interceptor while we’re at it. It is common style in Pedestal applications to make heavy use of the core functions like update and update-in. They are good at taking out a part of a nested data structure, applying a function to it, then reattaching the updated part. Let’s see how this interceptor would change if we refactor it that way. We’re going to take one more step toward Clojure mastery. Do you see the coerce-body function? It looks inside the context. If there’s already a "Content-Type" header on the response, then it does nothing and returns the context without modification. On the other hand, if there is no content type assigned yet, it modifies the context by updating the response. This is a really common pattern in functional languages. You want to make a series of changes to a data structure, where each change is conditional on some other logic. In an imperative language, this would look like a series of if statements whose bodies each mutate the object being built. In Clojure, they would look like a deeply nested if special form, where each if returns either a modified or unmodified version of the input. The trouble with deeply nested `if`s is that it’s too easy to get lost in the nesting. 1 This is the test clause. It says "if there is no Content-Type header"
If there were more clauses in the cond→, each clause would receive the value returned from the previous clauses. We’re now getting a fair bit of code. This would be a good time to think about splitting into namespaces for different responsibilities. We’ll tackle that some other time. For now, let’s take a look at the whole thing. Spend some time making sure you understand how and when each line of code gets invoked. We also learned about interceptors and created a few. The truth is that server-side applications don’t vend out HTML nearly as much as they once did. APIs are where it’s at. In the next guide we will make a REST style API to serve up wish lists.